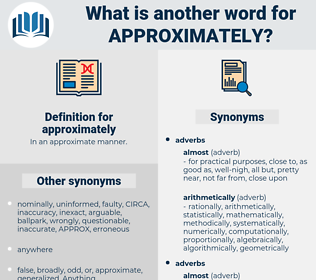 What is another word for approximately? Appointments, estimates, averages, periods, contracts, levels, places, Clients, Forms, Incentives, Surveys, forces, results, offers, individuals, guys, LINEs. approximatly, virtually, closely, practically, barely, broadly, probably, relatively, perhaps, fairly, substantially, somewhat, pretty, essentially, carefully, largely, closer, significantly, so, shortly, generally, least, appreciably, maybe, basically, there, much, currently, just, less, somewhere, up. monitored, Averaged, Consisted, led, Told, Were, arranged, said, attached, Accounted, estimated. Comprising, Averaging, Residing, coming, Checking, looking, holding, accounting, trying, dealing, finishing, Doing, making, getting. employs, looks, accounts, Has, sees. definitely, clearly, exactly, precisely, accurately. sharp, squarely, just, smack-dab, even, due. Amy's mother said approximately the same thing as she was packing her bags. And other things that are only approximately true, things that wouldn't happen in my presence, but which I am very sure must have happened.